The Town will include the proclamation for Terry Fox Week on the Newmarket Town Page and promote the run through its other communication channels. Town of Newmarket Council received a report to adopt By-law 2018-45 Fees and Charges for services or activities provided by the Town of Newmarket’s Legislative Services – licensing fees for 2019. Qualify to win free bread from COBS Bread! Make sure you’re on the Municipal Voters’ List! Get on the list at newmarket.ca/vote. By ensuring you’re on the list, you will get your Voter Instruction Letter in the mail by early October - call us at 905-953-5121 if you haven’t received it by then. 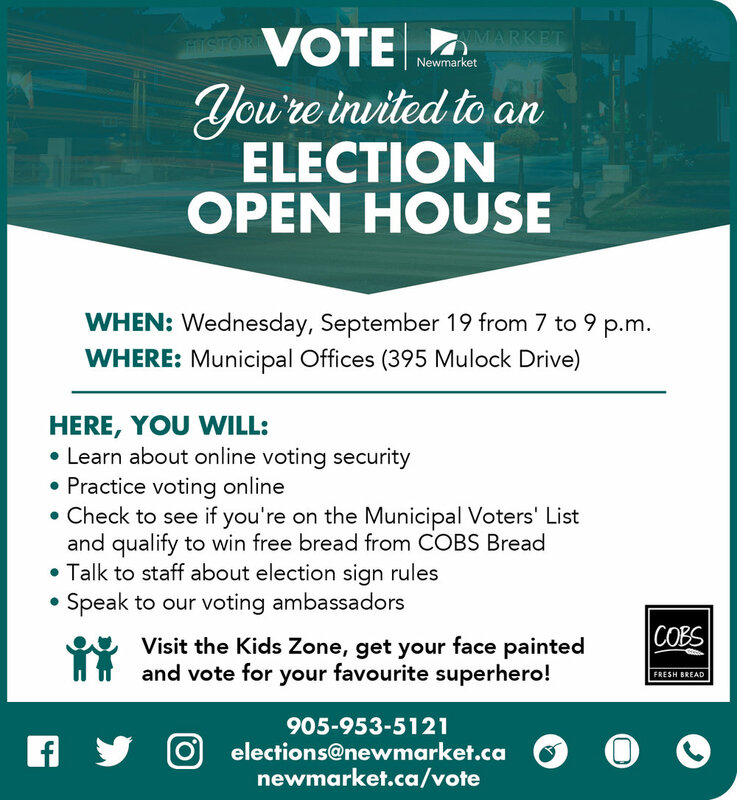 If you check, confirm or register your voter information, you’re automatically entered to win bread for a year, or 1 of 10 $50 gift cards from COBS Bread. Farewell Mayor in the Square!Join Mayor Tony Van Bynen for an informal, drop-in farewell, “Mayor in the Square” event on Saturday, September 29, from 10 a.m. to 2 p.m. at Newmarket Riverwalk Commons (200 Doug Duncan Drive). More information to come, please visit newmarket.ca for more details. A Splash of Culture returns for its third year of incredible arts - on a unique stage at the Tim Hortons Skating and Water Feature at Newmarket Riverwalk Commons. Bring your chair, your family and friends and enjoy an evening of entertainment listening to music in a stunning setting. Admission is free. Location and time: Newmarket Riverwalk Commons (200 Doug Duncan Drive) from 8 to 10 p.m. The ARCH Committee, comprised of the Newmarket Historical Society, Heritage Newmarket and the Elman W. Campbell Museum, will present a re-enactment of the 1837 Upper Canada Rebellion, in which Newmarket played a vital role. The event will involve an encampment of military re-enactors, settlers, vendors, and craftspeople. Location and time: Fairy Lake Park (Water Street) on Saturday from 9 a.m. to 8:30 p.m. and Sunday from 10 a.m. to 5 p.m.
Join us for Culture Days Open House! View our new exhibit: Quilts Old and New. Try a museum history hunt and go on a self-guided tour of historic Main Street. Admission is free. For more information, please call (905) 953-5314 or email: elmanmuseum@rogers.com. Location and time: Elman W. Campbell Museum (134 Main Street South) from 10 a.m. to noon and 1 to 4 p.m.
Join us as we tour Downtown Newmarket and unleash the stories of the past. Sponsored by snapd Newmarket, guests will be taken on a guided walking tour of Main Street and the Old Town Hall where they will learn about the many suspicious events and anecdotes that have haunted the area since the 1880s. Throughout the evening, guests will also have the opportunity to learn more about paranormal activity, and by the end of the evening, they will experience a real live paranormal investigation and any findings hosted by the Georgina Paranormal Society. This exhibit showcases 44 captivating and rarely displayed quilts from the Museum's collection, as well as quilts loaned by members of our community. See an array of stunning quilts including ones made by Elman W. Campbell's mother and grandmother. Enjoy the beautiful patterns and colours of Dresden Plate, Colonial Lady, Double Wedding Ring, Underground Railroad patterns, view a Quilt of Valour, and much more. Curated by Lynn Robitaille and Janet Charpentier-Burling. Stop by the Newmarket HollisWealth Story Pod at Newmarket Riverwalk Commons (200 Doug Duncan Drive). Visit the Story Pod to take a book, read it at your leisure and return it once you are finished, or bring another book to share with the community. The HollisWealth Story Pod, in design and function, encourages you to open your heart and mind to life’s possibilities similar to the way a book does. The HollisWealth Story Pod is open daily from 9 a.m. to 9 p.m. (weather dependent). This Story Pod is sponsored by HollisWealth, AKB, Scholastic Canada and the Newmarket Public Library. Location and time: Newmarket Riverwalk Commons (200 Doug Duncan Drive), daily from 9 a.m. to 9 p.m.
For up-to-date weather and cancellation details of Town-run outdoor events, please call 1-877-PLAY936 (1-877-752-9936) on the day of the event no more than two hours prior to the start time. Children under 12 years of age must be accompanied by an adult at all events. Please contact the Town at 905-895-5193 or visit newmarket.ca/events for more information. The Town of Newmarket Chief Administrative Officer (CAO), Bob Shelton has announced he will retire from the Town of Newmarket on November 30, 2018. Mr. Shelton has been the CAO since 2002. He began his career with the Town of Newmarket in 1977 and has fulfilled various roles throughout the organization. Leading through a culture of collaboration, both internally and externally, including the creation of the N6 municipalities group/committee (Aurora, East Gwillimbury, Georgina, Newmarket, King and Whitchurch-Stouffville) which has realized many efficiencies and collectively saved the municipalities millions of dollars. Read the full media release for more information.